The extra soft blue nylon brush is designed for cleaning flexible transparent screens (plexiglass) and perspex. 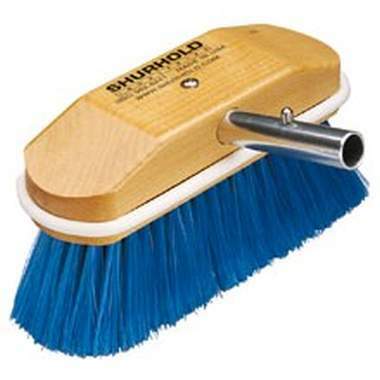 07050 8 inch (20cm) Side-Attached Extra Soft Blue Brush (310) Shurhold brushes feature a hard wooden base, premium quality bristles, rust proof nickel-silver stapling wire and a wrap around safety bumper. Side Attachment The side attachment enables cleaning of the side of the boat from the deck. Standard brushes may be converted using the curved adaptor (07170). Shurhold s exclusive SHUR-LOCK quick release system locks any Shurhold handle quickly and easily with all Shurhold accessories.